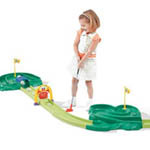 Check out this great toy Par 3 Mini Golf Course. So cute and so fun! It’s made by Step2 which is well known for their high quality plastic outdoor toys and playsets, so you know this is good quality. Suggested for kids age 2 years old and up, this toy can be setup indoors or outside in grass or concrete. Kids can arrange the pieces a few different ways so that they can create different patterns and obstacles. Comes with 2 putters and 2 golf balls. Kids love to play with toys that imitate the activities they see parents and adults do. 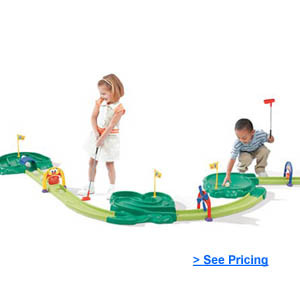 This is a great gift for the little guy or gal who wants to be golfer, “just like Dad”.